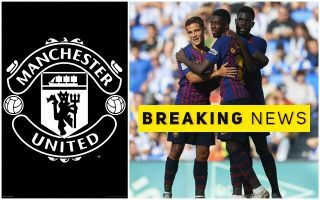 Manchester United have received something of a transfer boost as it looks like Barcelona are lowering their demands for Philippe Coutinho this summer. The Brazil international has struggled in his time at the Nou Camp, and it looks increasingly like the club may now have given up on him. United have been linked with Coutinho on a number of occasions and Goal now claim his asking price has been cut to just €80million. It was only recently that the Red Devils were linked with the former Liverpool star, but with Calciomercato claiming they’d have to pay more like €100m for his services. United could do with Coutinho as an upgrade on Alexis Sanchez, who has majorly flopped since joining from Arsenal in the same transfer window that saw Coutinho leave Liverpool for Barca. If the 26-year-old can show the kind of form he displayed in his time at Anfield, he’d be a fine purchase for Man Utd, and at Goal’s reported lower fee it wouldn’t be as big a gamble as it had previously looked. Still, Goal add that Coutinho would seemingly prefer not to move back to England, with Paris Saint-Germain perhaps the most likely side to secure his signature.